Swimming Success with Karalynn Call. Learn to swim in 8 days or less. 1. Within the area of crying and fear, probably the most important factor is how you the parent react. If you reinforce crying by paying more attention to your child when they are crying you will get more crying. 2. What the child really needs is for you to support his efforts by reinforcing the positive things they are doing. This can be done by clapping and giving verbal praise during and after the lesson. Make your comments as specific as possible i.e. "nice laying quiet on your back"
3. Talk to your child about their lessons what was easy today in lessons what was hard? Remind them as they move hard things to the "easy" category that they have mastered a skill. 4. Let them watch some other lessons. Point out to them that it seemed easier for the child when he listened and did it the way the teacher suggested. 5. When you see another swimmer doing something your child can do say, "You can do that too!" If you see another swimmer doing something they are struggling with remind them that if they keep working on the skill it will become easy for them too. If you see a swimmer doing something your child has never done say, "You will work on that skill some day when you are ready and it will become easy too." Examples of these skills would be: face in the water to pick up rings, floating without help, rolling back to breath. 6. Talk with them about other successes they have had and how they had to work to develop the skill. Maybe even show them movies of them learning to stand, walk, use a fork, and other things that are easy for them now. 7. Let them show off or tell their daily accomplishments to parents, siblings, and neighbors. Tell the person, "Jake got his treat for being a hard worker in swimming today. He especially did ________ well (Catching the wall, floating, and kicking finding the rings.)" 8. Make up songs to sing together on the way to and from swimming. Jenny swims with big scoops big scoops big scoops. Change the song to fit the situation. 9. Let your child pretend to be the swimming teacher with toy people in the tub or with stuffed animals on the couch. This lets them feel in control and you may learn by listening where their biggest concern lies. 10. ALL fears are learned, and the only way to overcome a fear is to confront it and conquer it. If you are afraid and your child sees that fear it will be harder for them to ever feel comfortable in the water. 11. 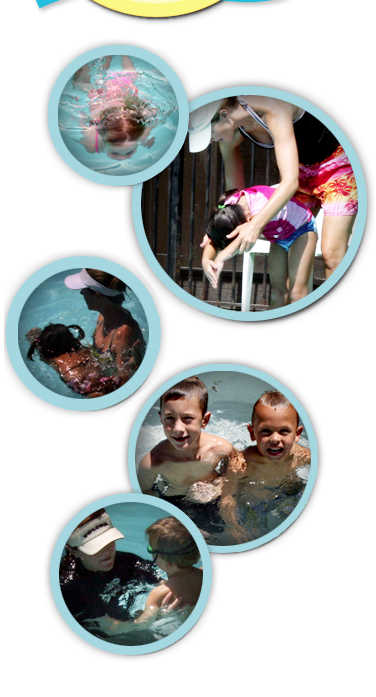 Once your child has learned to swim please continue to reinforce positive swimming behaviors. Avoid allowing them to swim in a floatation device. It causes poor head orientation. 12. You play a big part in making this a positive experience. Remember even if your child is not yet verbal they understand a lot of what you say and also HOW you say it. These lessons are individualized to meet the needs of each student, so please communicate any concerns you may have and let's work together to help your child experience success!